Governor Of Akwa ibom State, Mr Udom Emmanuel yesterday, signed a MOU with with Ashdene associates on Agriultral and Infrastructural development. A Singapore based investment organization, Ashdene Associates Nigeria, has signed an agreement with the Akwa Ibom State Government to invest in agricultural development, infrastructural expansion and consolidation worth about $100 million. 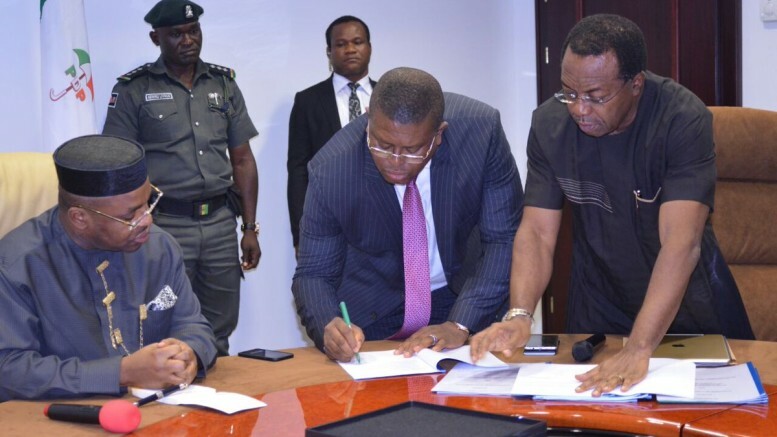 At the signing of Memoranda of Understanding (MoU) at Governor’s Office, Uyo, the State Governor, Udom Emmanuel, said his administration was committed to laying a formidable economic foundation to fast-tract an all-round development of the state. He explained that the Ashdene Group from Singapore reputed to have successfully executed business in about 29 countries of the world decided to partner the state in its agricultural, infrastructural and industrialization drive. The Governor was excited for the decision of Ashdene Group to make Akwa Ibom State its destination for their investment and to collaborate with the state in the area of investment in addition to infrastructural consolidation and expansion . Be the first to comment on "Singapore Firm to Invest $100 Million in Akwa Ibom"